GIPCA’s Exuberance Project will investigate what is abundant, overflowing and unrestrained in creative practices in and of Africa. Forming part of UCT’s Africa Month celebrations, this investigation takes the form of a symposium, exhibitions, film screenings and a series of performances all of which takes place on Hiddingh Campus and surroundings from 11 – 13 May 2012. As part of the opening night, styled on masquerade with stilt walkers, fire dancers and other performers, Exuberance audiences will be taken to David Kramer and Taliep Petersen’s smash hit musical, Kat and The Kings. More than a decade after its double Olivier award-winning run in London’s West End and On Broadway in New York, Eric Abraham and the Fugard Theatre present a new production this high energy musical, performed for the very first time in the heart of District Six, with a combination of award-winning soloists and a dazzling new young cast from Cape Town. Set in Cape Town’s District Six in the 1950s, Kat & the Kings explores the journey of teenager Kat Diamond (played by Dean Balie), from singing outside the Westminster Café to recording a seven single record and performing at The Claridges Hotel in Durban. Young Kat, who is convinced that he is the best singer and dancer in District Six, forms the a cappella group the Cavalla Kings with his friends Ballie (Carlo Daniels), Bingo (Grant Peres) and Magoo (Zak Toerien). When Magoo’s sister Lucy Dixon (Amy Trout) decides to take them under her wing, the quintet, with their American doo wop and rock and roll influences, becomes a sensation in the District. Danny Butler; who played the older Kat Diamond in London, Frankfurt, Hamburg and Vienna; will reprise his role at the Fugard Theatre. Audiences can look forward to the accompaniment of a six piece live band, led by the talented musical director and saxophonist Don-Veno Prins. Saturday will feature two extraordinary performances in Hiddingh Hall. 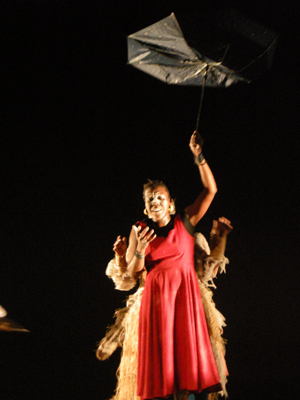 Dance Theatre practitioner Mamela Nyamza directs, choreographs and performs Isingqala. After its premiere on the Main Programme at the 2011 National Arts Festival, Grahamstown, where it was presented as part of the body of work celebrating her Standard Bank Young Artist Award for Dance; it has also been performed as part of the USA’s Different Voices, at the Bates Dance Festival and Slovenia’s Gay and Lesbian Film Festival. Known for exploring provocative themes, Nyamza considers what happens when that quiet crying inside becomes sound, when ‘private’ becomes ‘public’, when others find their own cries in you. Considering private/public experience, she suggests that where we are as a country, is in a state of Isingqala (isiXhosa for ‘sorrow’) and that we are crying inside – in constant ‘recovery’ or ‘aftermath’ of our shared and very different histories. Nyamza explains “We seem to say the same things, ask for the same things; we seem to cry for the same things and yet we seem not to understand one another”. Through her work she attempts to express, validate and celebrate this shared and separate state of being, by expressing it through a movement and sound experience. Afrocartography: Traces of Places and All Things In Between is an interdisciplinary playreading performance work written by Mwenya Kabwe, and featuring Lesoko Seabe, Lauren Steyn, Themba Stewart and Mwenya Kabwe. The work premiered at the UNESCO World Festival of Theatre Schools in Barcelona and has been especially restaged as a play reading for the Exuberance Project with the original cast. Afrocartography takes a close, poetic, and visually stimulating look at some of the contradicting tensions of hybrid cultural identity, national belonging, and the numerous associations of global citizenship. Described as a story of migratory proportions through both real and embellished dream spaces, the narrative follows a traveler and a Mapmaker; forging new paths, revisiting engrained routes and imaging a world where contradiction, uncertainty and an acceptance of complexity as a point of departure, is the norm. It is an invitation to visit a realm of existence where dreaming, waking, memory and imagination overlap, to offer up a view of complex landscapes that merge the inner and the outer and celebrate a new place of truth.